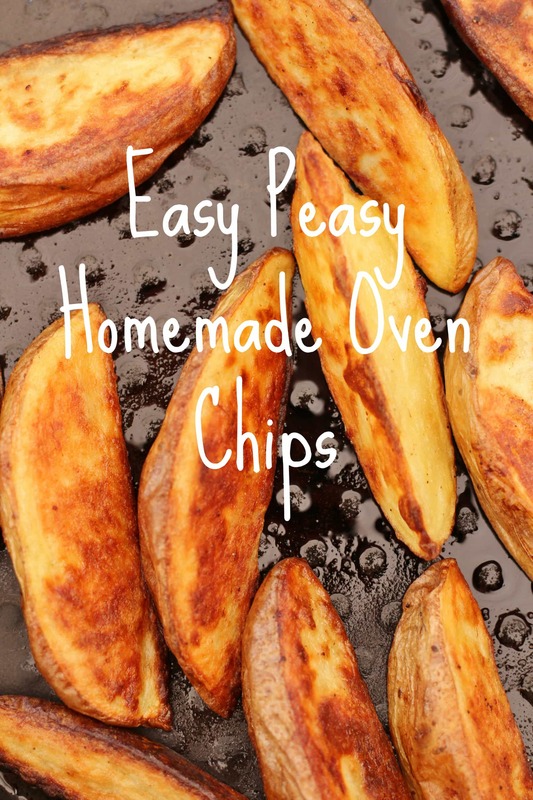 These Easy Peasy Homemade Oven Chips are easy and quick to make, super tasty and so much better for you than shop-bought oven chips. Mmmm – chips. 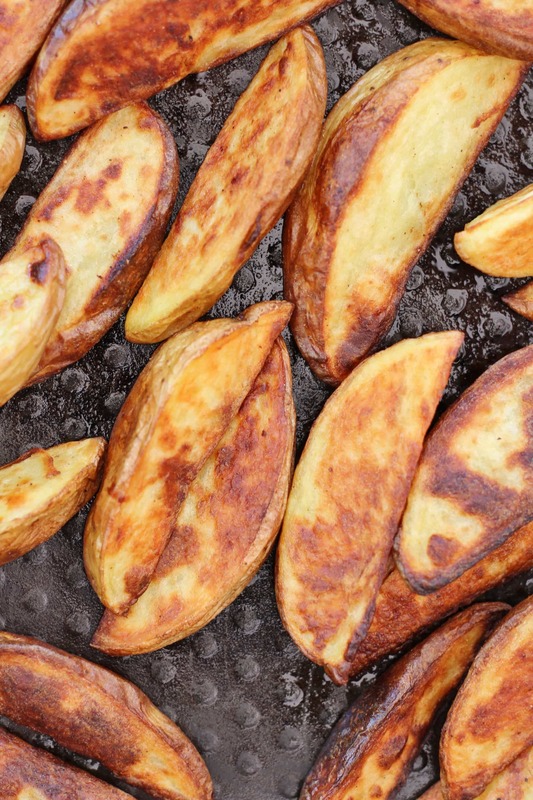 I do love chips, but the kind you get from the shop and bung in the oven are…well they are convenient and great for playdates – but they are not exactly a health food are they? 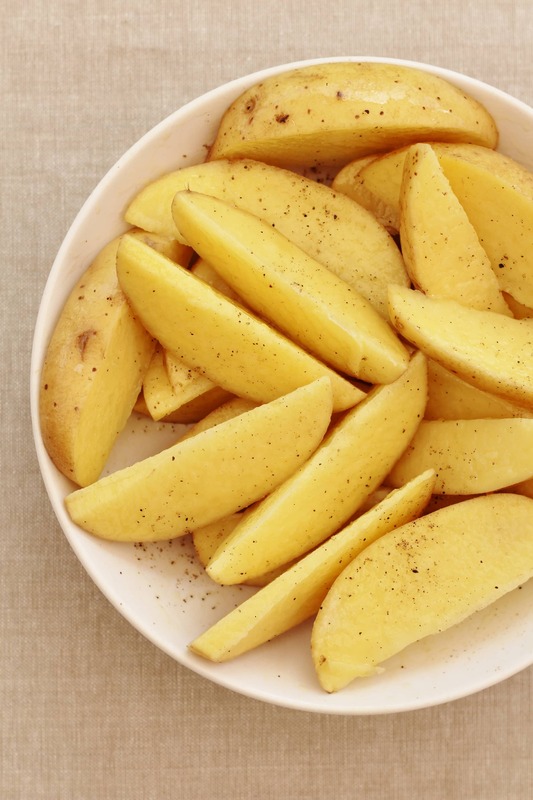 My chips are made from baking potatoes with the skins left on, olive oil and a little salt and are much more healthy than their shop bought cousins…not only that, but they are way tastier (well, I think so – I often find the shop bought ones rather anaemic and bland). 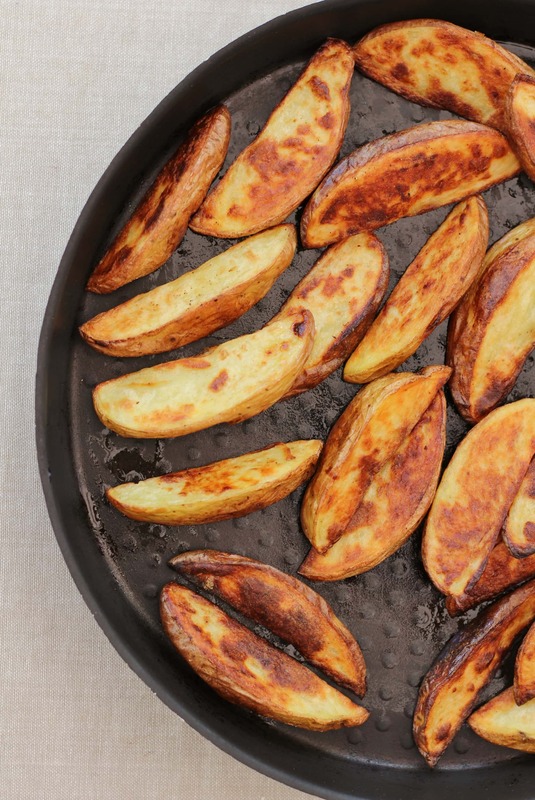 And they are so simple to make – in the time it takes to heat the oven (which you’d have to do anyway), you can chop a lot of potatoes into chip shapes and they take only a few minutes more time in the oven than frozen chips – yey! Still not convinced? Just think of it like this…most people would consider a baked potato healthy…so my chips are basically just a baked potato chopped up into chip shapes! And they cook much quicker than a baked potato…and taste just as nice, if not nicer! And did you know – potatoes are chock full of goodness? They contain potassium, fibre, Vitamin C and B6, protein, calcium, iron and magnesium and manganese – all things we need for a healthy body and a medium baking potato comes in at only 160 calories! 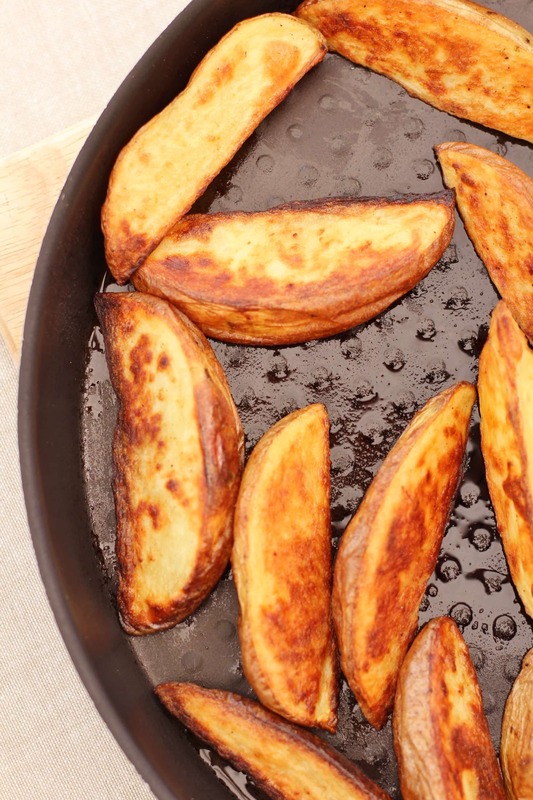 Check out this article on the health benefits of potatoes in the Huffington Post for more info. In fact I always do chips like this, these days – and have done for years…my kids love them… the only time I do cook the shop bought version is when my kids have a little friend for tea…I find in that situation shop bought oven chips are best…just to be on the safe side! I mostly just like these chips coated in a little olive oil, salt and pepper…but feel free to experiment with other flavours if you fancy…paprika, cumin, cayenne pepper, chilli would all work well. I like to serve these with either a steak, a homemade burger or pan fried tuna steaks and a big salad, but obviously they will go well anywhere where you would normally eat chips!! Make sure your oven is nice and hot before you start – if the oven is still coming up to temperature the chips will be less crispy. 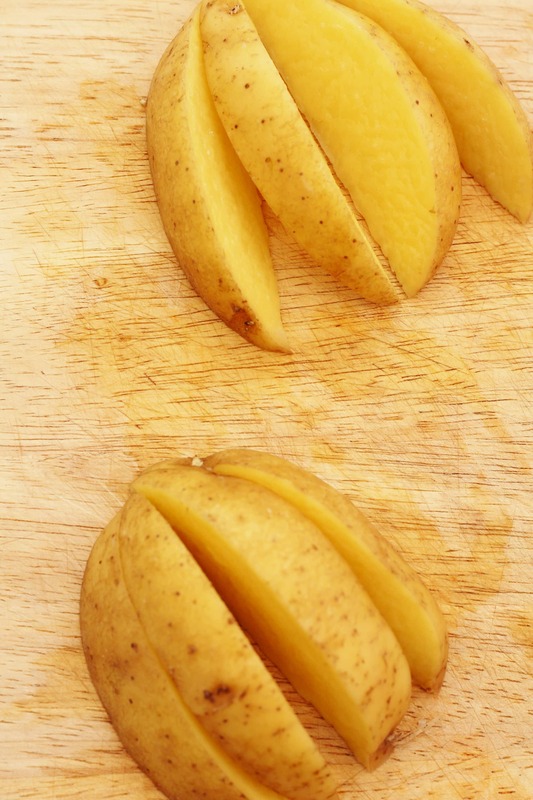 Don’t peel the potatoes – so much of the goodness is in the skins! I find it much easier to put the oil, salt and pepper on the chips in a bowl and give everything a good mix before putting them on the baking sheet. This also means you will need less oil than if you try to drizzle the oil on the chips when they are already on the baking tray and they are less likely to stick. 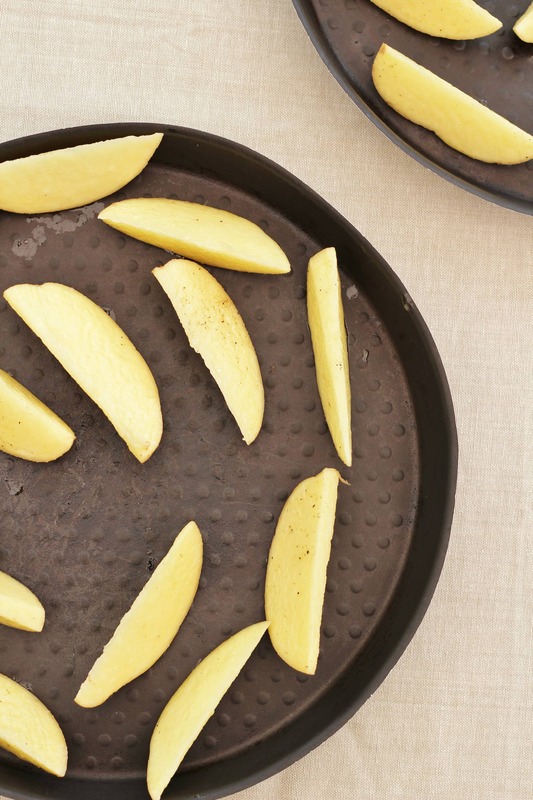 Try to use a metal, non-stick baking tray (or roasting tray). I actually tend to use my pizza trays as I find they give me the best results. Try not to use not glass or ceramic oven dishes as they don’t work so well. Spread the chips out on the baking tray so they are not touching. If you cram too many together they will not cook well and you will end up with very anaemic chips! Much better to spread them out over several baking trays. Do turn the chips at least once while cooking – preferably twice, this helps to ensure the chips cook evenly and don’t stick. , which are similar to the ones I use. Don’t be afraid to let the chips go quite dark in colour – they will taste better (though don’t burn them, obviously!). Eat the chips straight away or they will go soggy! Cut the potatoes into chip shapes and put in a bowl. Drizzle with 2 tablespoons of olive oil and add a little salt and pepper. Mix together thoroughly so all the chips are evenly coated in the oil and seasoning. Spread the chips out on the baking trays - you will probably need 2 or 3 to ensure the chips are well spread out and not touching. Put the baking trays in the oven for 10 minutes. After 10 minutes take one baking tray out of the oven and turn all the chips over. Put that tray back in the oven and repeat for the other trays. Cook the chips for 10 more minutes, then repeat - turning each chip again. Serve with a nice steak, a homemade burger, a tuna steak or whatever you usually serve chips with. They look lovely and crispy! I always have to peel my potatoes though as my daughter seems to have something against the skin. I’m hoping she’ll start to like it one day though as she used to want the crusts cut off bread but now saves them till last as she says they’re the best bit!